I really never thought of it until this morning but, living in the era of seeing analog televisions switch to digital makes me old….real old. Most of today’ younger generation haven’t a clue what a CRT television is (that is cathode ray television), much less what it weighed when you had to reposition or move it. Let’s not even speak of rabbit-ear antennas or how normal it was to have someone move them around to find ‘that best picture’. Since moving to digital, we have seen SD become HD, and 460 climb to 720p, 1080i, 1080p, 1440p, 4K to 8K and on an on and on. Technological advance has literally brought us clarity and, though you may not think of it, this small storage device the size of, well…what a stick of gum used to look like, plays a massive role in all of this. This little baby right here can move up information at up to 3.5GB/s. This equates to moving about 20 bankers boxes of files, or staying with media, moving a blue ray movie in just a little over a second ‘at top speed’. In the SSD world, it would be very rare to see any storage device reaching its peak advertised performance, but it is important to remember that our world today relies on SSDs such as the new Samsung 970 Pro 1TB NVMe SSD to move information at lightning fast speeds. This, not only allows today’s media creators to create and manipulate unimaginably large chunks of data quicker and more efficiently, but also, it creates a world where we don’t have to even consider how something is done with such ease. Consider this; today we get sports replays almost instantly, whereas just a few years back, you may have relied on commercials before that was possible, and yet a few years further back, this wasn’t even imagined in instant time. NEXT UP: CHECK OUT OUR SAMSUNG 960 EVO 2TB REVIEW. 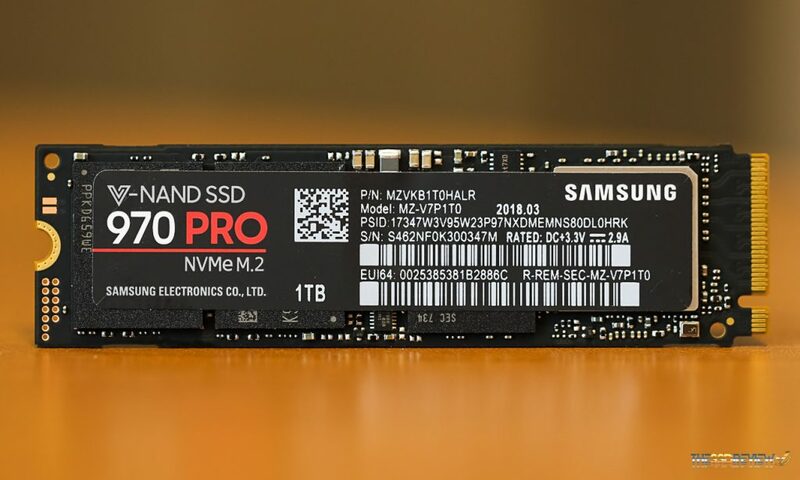 Samsung today announces its third generation NVMe SSD, the 970 Pro, and it will hit retail shelves on or about 7 May 2018. If you are looking for a bargain SSD at a great price, move on my friend because this SSD wasn’t built for value and we will get to the reasoning for that shortly. 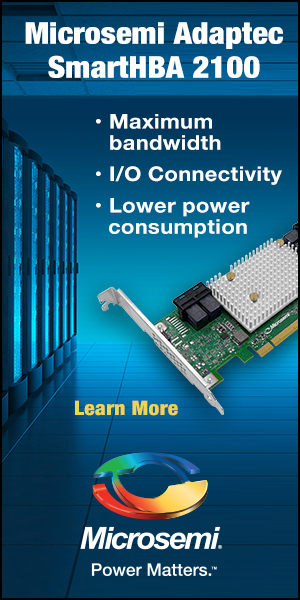 The 970 Pro is a PCIe 3.0 x4 NVMe 1.3 M.2 2280 (80mm) SSD and will be available in 512 and 1TB capacities. The 970 Pro is capable of data transfer speeds of 3.5GB/s read and 2.7GB/s write, along with up to 500K read and write IOPS, which would be an industry leader if achieved here today. It comes with a five-year warranty that follows a maximum 600TBW for the 512GB and 1200TBW for the 1TB version, and MSRP is set at $329.99 and 629.99. It has AES-256 data encryption and SED (self-encrypting drive) technology, and power is listed at 5mW sleep, 30mW idle, 5.2W read and 5.2 to 5.7W write. Watch Amazon for the 970 Pro release and pricing! 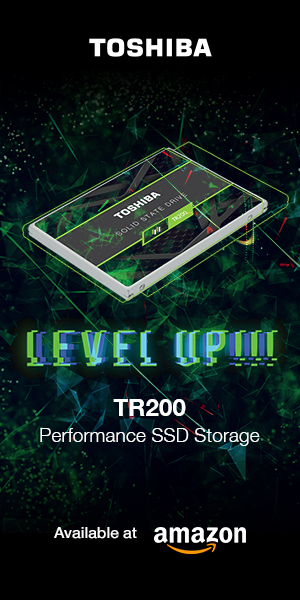 As much as we would have loved to have active power testing completed for this SSD today, it was only received, totally unexpectedly, a few days ago and our posting of this report had to be balanced with a few luxuries not being included. 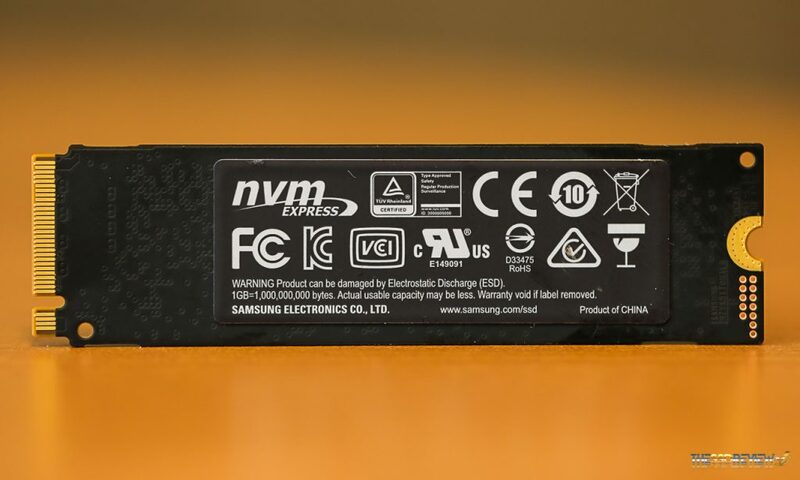 The Samsung 970 Pro NVMe SSD is a single sided 2280 form factor SSD with the controller, DRAM cache and two memory chips located on its face, covered of course by its branding sticker. 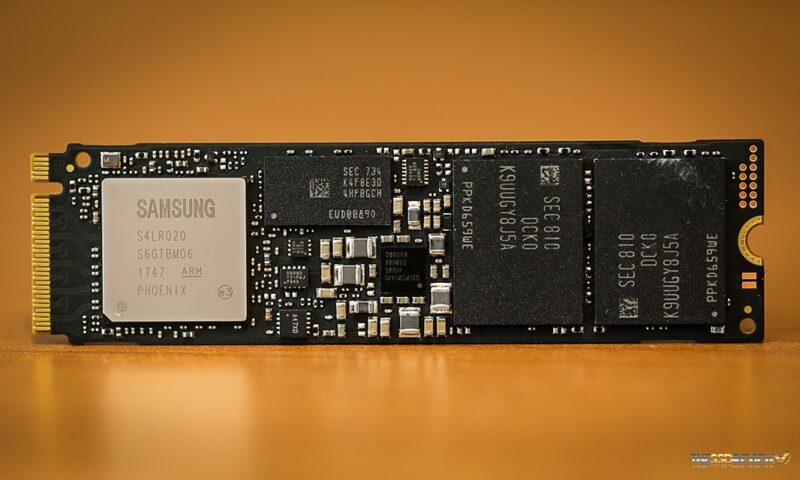 This SSD contains Samsung’ newest Phoenix NVMe controller which is nickel-plated to enhance heat dissipation, along with a new heat spreader with an integrated copper film. Samsung’ own Dynamic Thermal Guard (DTG) also teams up to throttle performance and protect the SSD and data should overheating occur. The key here is that more effective cooling on the front end ensures effective heat dissipation so that we may never experience thermal throttling. 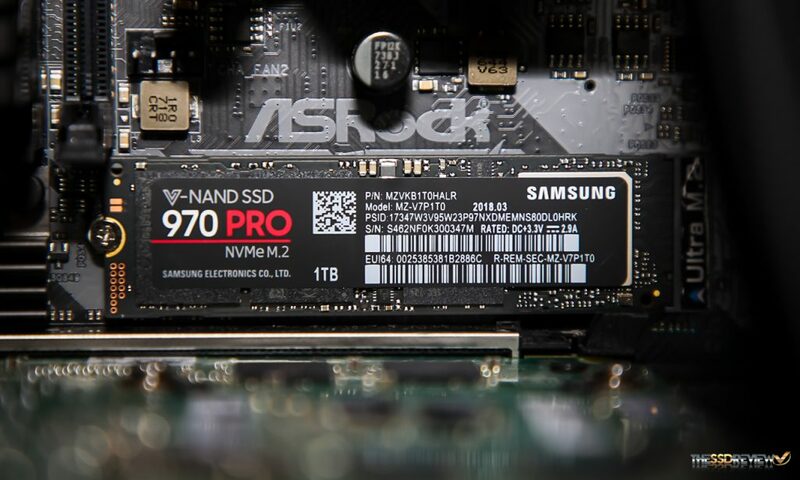 The beauty of the 970 Pro is its memory which is Samsung’ latest 64-Layer V-NAND 2-bit MLC NAND flash memory. Performance. efficiency and endurance all play key roles in this memory, 2-bit MLC being somewhat of a rarity in the SSD world these days, and it being entirely responsible for that premium price point. 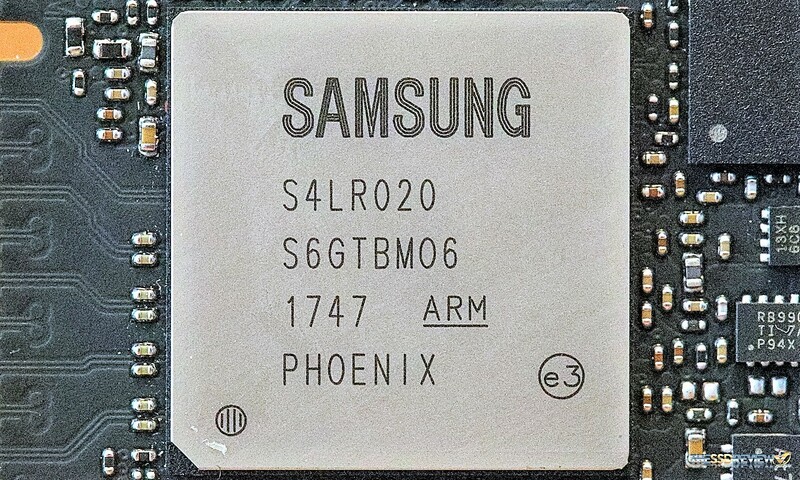 Our sample 1TB version provides two memory chips, each having a RAW value of 512GB each, and the final formatted volume providing 954GB of storage to the user. In the center of the SSD is also a Samsung LPDDR4 DRAM chip, sized at 512MB for the 512GB and 1GB for the 1TB model.